The world is watching closely, some fearfully, as news comes in now daily about the Doctor and his nurse who contracted Ebola virus in Liberia, Nigeria. Untreated, most victims dies within a week. Now there’s a serum, but there’s also blood transfusion. This additional article by Tom Solomon of University of Liverpool helps waylay the fears and gives hope to the families and loved ones of victims. Our understanding of Ebola has increased considerably since outbreaks of a mysterious haemorrhagic fever caused by an unknown virus first occurred in Southern Sudan and the Democratic Republic of Congo in 1976. We now know a lot about this zoonotic virus that spreads from animals to humans; we have determined its complete genome sequence, and structure, and the different subtypes. We also know how it spreads and how to control it, even if carrying that out is more straightforward in some countries than others. Outbreaks begin when someone gets infected by a fruit bat, probably through contact with its bodily fluids (blood, saliva, urine, faeces). Alternatively the first case may follow contact with infected “bush meat” such as chimpanzee. Secondary human cases contract the virus from the infected bodily fluids of the first case, typically blood, vomit, or diarhhoea. The virus is not spread by respiratory routes such as coughing, and sneezing; this means it is less infectious than flu viruses, and so is unlikely to cause a pandemic. People are infected through direct contact with the infected secretions. We don’t think the virus bores through the skin, rather it enters the body through broken skin (scratches) or through mucous membranes such as the eyes, nose and mouth. So, the virus spreads to relatives and hospital workers caring for patients. The re-use of contaminated needles was an important factor in the early outbreaks of the 1970s. Although there is no antiviral drug or vaccine, scrupulous nursing methods using personal protective equipment stop the spread of the virus, and have brought previous outbreaks under control within weeks and months. So given that we know all this, why is the current outbreak in West Africa proving such a problem? 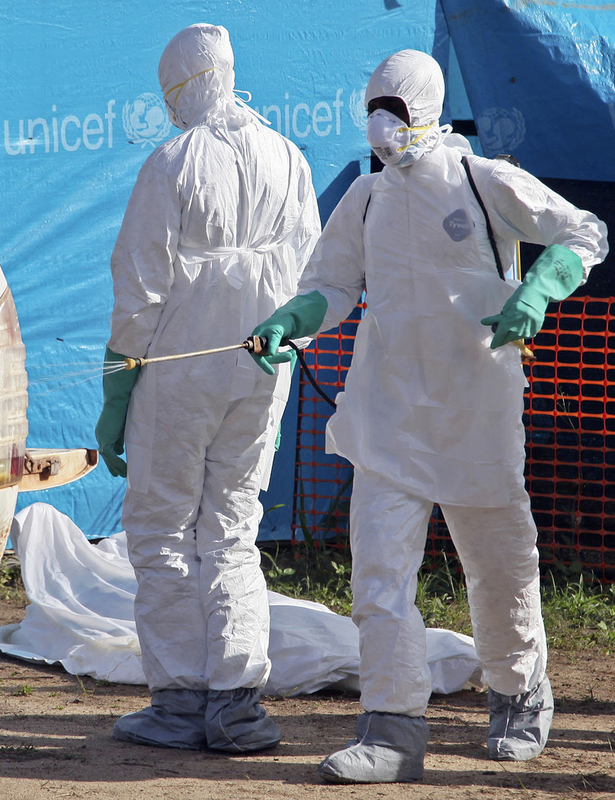 Research early in the outbreak showed that although the strain responsible, Ebola-Zaire, is the most severe, there doesn’t seem to be anything particularly unusual about it. The current problems are more to do with human behaviour and societal factors than anything else. Whereas countries in Central Africa, like the Democratic Republic of Congo and Uganda, are used to dealing with Ebola from occasional outbreaks that have occurred over the last few decades, this is the first time West African countries have really been hit. And it has triggered the panic, fear and suspicion which characterised the early outbreaks in Central Africa in the 1970s. Those who are ill, rather than seeking the help which might have saved them and protected others, have often fled. Outreach teams attempting to go into villages and communities have sometimes not been welcomed, making the task even harder. Because this is the first outbreak in West Africa, local health care teams have little or no experience of dealing with the problem, and the infrastructure takes time to establish. So, although people understand the theory of using personal protective equipment to safeguard themselves, the practicalities are not so easy. This is likely why one of the leading doctors fighting the disease in Sierra Leone died from from the virus. But the risks to those who wear full personal protective equipment, with impermeable gowns or suits, long gloves, hoods and goggles are minimal, especially if accompanied by appropriate training in how to use the equipment. Health workers in full protective gear. In contrast simple barrier methods – wearing an apron, gloves and cotton mask – while providing some protection, are not as safe. And when faced with a patient bleeding to death in front of you, the desire to try and help can sometimes override theoretical knowledge about self-protection. I know this from personal experience as a junior doctor caring for patients with haemorrhagic fevers in Asia. The spread of Ebola from Guinea to neighbouring Sierra Leone and Liberia, and travel of one infected man to Nigeria raises concerns about the virus’ ability to spread. Previously the disease primarily affected those living in jungle areas and the health workers caring for them. But the bigger an outbreak, the greater is the chance of further spread to new areas. In developed countries we have established systems to protect against such eventualities. In the UK, we have the Imported Fever Service, run by Public Health England in collaboration with our team in Liverpool and colleagues in London. It specifically exists to provide advice around the clock on patient care, diagnosis, and public health interventions that may be needed. We are thus ready to help with any returning traveller if needed – and indeed two such people have recently been assessed and found to be negative for Ebola. Teams in Africa, including people from Public Health England, and members of the Health Protection Research Unit are helping efforts to bring the current outbreak under control. This involves finding possible cases, diagnosing them and giving them supportive treatment with fluid to get them through the acute stages. Patients are isolated to prevent further spread, and their close contacts are monitored. Public health education is also key, warning people about the risks of transmission to humans from fruit bats and monkeys, and advising on how to avoid human-to-human transmission. Once all these are fully established, the current outbreak should come under control. Tom Solomon receives funding from MRC, NIHR, Wellcome Trust, Gates Foundation, BBSRC.